ABC Digital Aerials is your one stop shop for Aerial and Satellite services in North Yorkshire. We have been installing aerials and providing related services to North Yorkshire for over 25 years so have a lot of experience in providing you a top class service. We will come to your property and install a new aerial to almost any part of your property. *Price includes visiting your property and installing a Digital TV Aerial, brackets, connectors and up to 15 meters of cable. All our newly supplied aerials are completely Digital TV Ready and work with all Freeview receivers & TV's. All work is fully tested and verified to be working before we leave your premises. If you have an aerial that has become damaged and needs repair, we can come to your property and repair your aerial installation. During the repair visit, we will ask you if you would like to re-use the existing aerial or if you would like us to replace the aerial with a new aerial, this is your choice and we will not try and persuade you to install a new aerial if you do not require it. 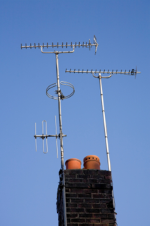 We can supply aerials, masts and brackets to you so you can fit the aerials yourself. We also welcome bulk aerial purchases and supplies, we can offer a local delivery or nationwide delivery. To book a visit, please use our online booking form to contact us or call the phone number above. Or phone the number above.